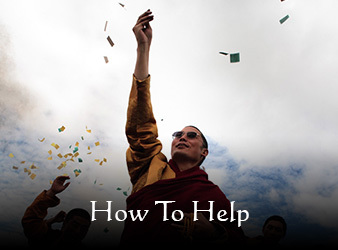 The Kilung Foundation brings humanitarian aid to Dzachuka in east Tibet while answering the call for Buddhist teachings throughout the world. The vision of Kilung Jigme Rinpoche has been to help rebuild and strengthen Kilung community through locally initiated projects, with the original focus of rebuilding Kilung Monastery. Revitalization of both secular and sacred aspects of life has been a guiding principle because in Tibet the vitality of each supports the flourishing of the other. Kilung Foundation was established in 1998 as a non-profit in Washington State. As a 501c3 organization, all donations are tax-deductible. In 2003 Pema Kilaya Rangjung Ngotsar Choling was founded as part of the Foundation’s mission of bringing Buddhism to the West. 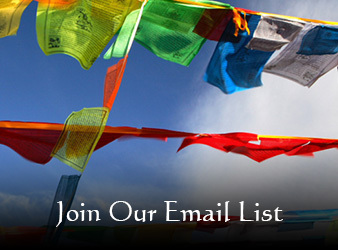 Pema Kilaya now has members throughout the world. pemakilaya.org. In 2004 a branch of Kilung Foundation was registered in Denmark by Danish supporters. With Kilung Rinpoche at its head, the Foundation has been in the unique position of ensuring that its projects are truly initiated by local people. Rinpoche works with tribal leaders and local officials to identify, prioritize, develop, and manage the projects. In April, 2016, the Kilung Shedra was destroyed by fire. The Foundation immediately turned its attention to emergency relief to provide temporary housing and classroom space for the children and monks, and then began designing a new shedra, preparing the site and fundraising to rebuild. For the latest reports on this and our other projects, read our News updates HERE. In 2015, the Kilung Foundation initiated the Dzachuka Nomad Yogurt Collective as a way to preserve the fabric of nomad culture. Eleven nomadic families have joined together to create a collective with a herd of 50 yaks, milking and making yogurt daily. The yogurt is sold locally, and the proceeds support the families and workers involved. This initiative has been very successful and in 2016 received a large government grant to expand. Read more HERE. The first of the Foundation’s projects was to rebuild Kilung Monastery’s Shedra, or, monastic college, completed in 2003. Its consecration was held in 2004, a grand celebration for Kilung community which hosted a thousand monastics, lamas, and lay practitioners from the region. The Foundation was the major sponsor for this Great Prayer Festival which also saw the formal enthronement of Kilung Jigme Rinpoche. In November 2014, the Shedra began a second Nine-Year program of study in Buddhist Philosophy and Practice. Also in November 2014, the Kilung Children’s School began its new academic year. Thirty boys from the local community, ages 8 – 12, are boarding at the school, which provides a strong Tibetan education as an alternative to either no school, or a government school in town. Another early Kilung project was building the Dzachu Bridge, completed in 2004 with major help from the local county. The bridge solved a severe challenge faced by hundreds of nomad families: crossing the daunting Dzachu River at least twice a year with their large herds. Hundreds of livestock and sometimes nomads lost their lives fording the river each year. Erecting the bridge has encouraged the people of Dzachuka to maintain their way of life. The renovation of Kilung Monastery’s 17th century temple, completed in 2009, was a long-term project with special importance: It is one of the few standing pre-revolution temples in Kham. Replacing the traditional sod roof with modern tile was a major hurdle to permanently protecting the sacred building. This was followed by internal structural renovation, and then extensive frescoes, altars, and decorative elements. Ponru School For Nomad Children began as a joint project with the Bridge Fund, a non-profit, which, in 2001, provided the funds for building construction. Operating costs were provided through Kilung Foundation donors and individual sponsorships for the 31 students who boarded at the school. The students received a six-year education, graduating in 2007. Half the students went on to Sershul Middle School, and six have continued on to high school in a variety of schools around Sichuan Province, all on government scholarships. A second boarding school, Kilung Children’s School, was begun in 2006 for that community. • Homes for Kilung monks. Fourteen cabins were completed in 2007, with another four in 2008, providing permanent homes for about 38 monks. • Kilung monks, lamas, and nuns have received support from individual sponsors since 2005. • The shedra seminary program has been formally educating Kilung monks since 2005. • The monastery’s dogs have been fed, dewormed, and neutered with support from Kilung Foundation’s Little Mountain Dog Project. • During the snow disaster of 2008 the Foundation provided animal feed, food for devastated families, and funds for a pilot program to bring back the ancient practice of harvesting wild grass for spring fodder. The latter was embraced by tribal leaders and adopted for the whole community. • The Foundation sprang into action to aid survivors of the Kyegundo earthquake of 2010, providing local Tibetan food for 2,000 quake victims for 12 days. A unique yak herd program followed, providing 300 Kyegu families in extreme need with Dzachukan yak dairy foods for the following two to three years. Go to Projects in this website for more details on these and our current humanitarian projects of the Kilung Foundation. • Tibetan architecture home/center in Sershul town serves as a center for Kilung Monastery and Foundation activities in the town, with spaces for meetings, Buddhist teachings and events, guesthouse, library, and offices. For spiritual services and animal life release, go to Services. 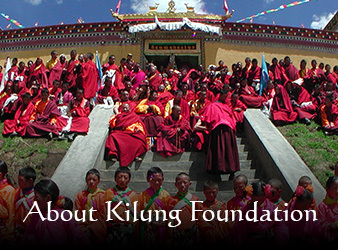 The Kilung Foundation logo encircles the Tibetan word “Ki” –short for Kilung. This word signifies a winged, bird-like being, a garuda, or flying. It’s shorthand for kilaya, the Tibetan ritual three-sided phurba, or dagger. These are also associated with the deity Vajrakilaya. The two spheres next to the word indicate its sacred quality. Kilung Jigme Rinpoche, calligrapher.